U.S. Navy divers, Air Force pararescuemen and Coast Guard rescue swimmers practice Orion recovery techniques Sept. 21, at the Neutral Buoyancy Laboratory (NBL) at the agency’s Johnson Space Center in Houston. The recovery team is practicing underway recovery techniques using a test version of the Orion spacecraft. Training will help the team prepare for Underway Recovery Test 5 for Exploration Mission 1 aboard the USS San Diego in the Pacific Ocean off the coast of California in October. 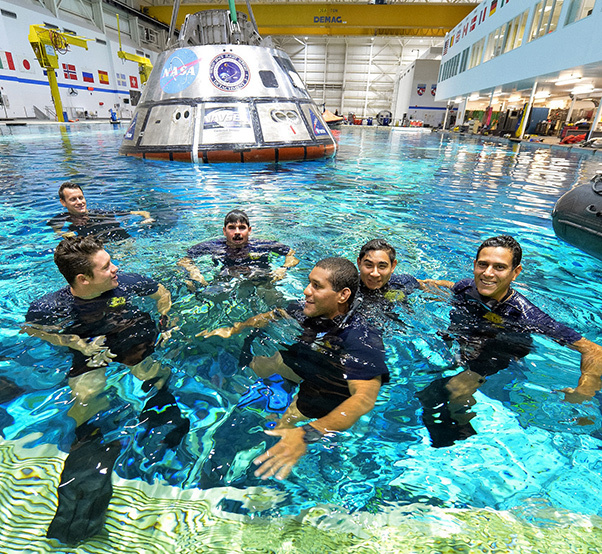 A group of U.S. Navy divers, Air Force pararescuemen and Coast Guard rescue swimmers practiced Orion open water recovery techniques Sept. 20-22 in the Neutral Buoyancy Laboratory, the largest indoor pool in the U.S., at NASA’s Johnson Space Center in Houston. They were preparing for the first test flight of an uncrewed Orion spacecraft with the agency’s Space Launch System rocket, known as Exploration Mission 1 (EM-1). When Orion returns from deep space missions and lands in the Pacific Ocean, a team of military and NASA personnel will be responsible for safely returning the capsule back to land. The team is evaluating tools and procedures they will use to tow the spacecraft into the well deck of a U.S. Navy ship. Construction began on the 6.2-million-gallon NBL in 1995 and was operational in 1996. It was built specifically for International Space Station size mockups. Its predecessor, the Weightless Environment Training Facility, was built in the 1960s for testing procedures, developing hardware and training astronauts. The current facility is primarily used to train astronauts for spacewalks aboard the International Space Station, but also has been used to help prepare for Orion recovery operations. During the evaluations, a test version of the Orion spacecraft was lowered into the water in the NBL. Divers used inflatable zodiac boats to easily steer to the test spacecraft. The team trained on how to inflate and secure the stabilization collar around the crew module. For a crewed mission, the collar will serve as a place to stand on to recover astronauts and assist them out of the capsule. U.S. Navy master diver Michael Hunt served as the technical expert for the team and was responsible for overall safety during training. He has been a diver for 23 years and is with the Explosive Ordnance Disposal Unit 3 in the Mobile Diving Salvage Co. stationed at the Coronado Naval Amphibious Base in California. “Everyone on the team goes out of their way to be helpful, and it is a privilege and honor to be a part of this NASA mission,” Hunt said. U.S. Navy divers prepare for Orion underway recovery training in the Neutral Buoyancy Laboratory at NASA’s Johnson Space Center in Houston on Sept. 21. A test version of the Orion spacecraft is being lowered into the water. Training at the NBL will help the team prepare for Underway Recovery Test 5 (URT-5) later this fall, which will be the first major integrated test in a series of tests to prepare the recovery team, hardware and operations to support EM-1 recovery using a U.S. Navy ship. The term “underway” refers to recovery tests done when a ship is at sea. 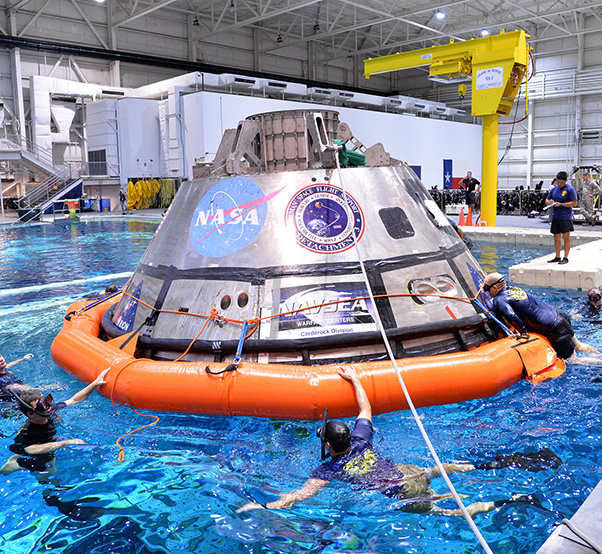 Training for URT-5 included first time use and training of new capsule attachment hardware developed by NASA as part of a research and development project. After a flotation collar was placed around Orion, divers practiced attaching the tow lines to modified tow cleat assemblies on the crew module. The tether lines were used to simulate towing Orion into the well deck of a Navy recovery ship. “The biggest challenges for the team will be weather and sea conditions during Orion underway recovery operations in the Pacific Ocean,” Hunt said. The tow cleats were modified to include a tow pin insert that allows easier tow line connections in the rocky waves of the open ocean. One end of the tow pin inserts and locks into place in the tow cleat, and the other end connects to the winch or tending lines. Also, for EM-1, Orion will have five attach points; two more than were on the crew module for Exploration Flight Test-1 in December 2014. 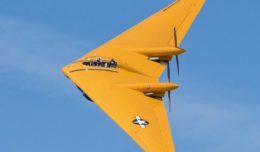 The divers, and engineers with NASA’s Ground Systems Development and Operations Program at Kennedy Space Center in Florida, will practice Orion recovery techniques in San Diego and aboard the USS San Diego in the Pacific Ocean off the coast of California in October. During EM-1, Orion will travel about 40,000 miles beyond the moon and return to Earth after a three-week mission. Orion will travel through the radiation of the Van Allen Belts, descend through Earth’s atmosphere and splash down in the Pacific Ocean.